A former top-four certainty is suddenly in danger of missing the eight, the coaching merry-go-round continues and did we just see a grand final preview? Here are the talking points for Round 22. 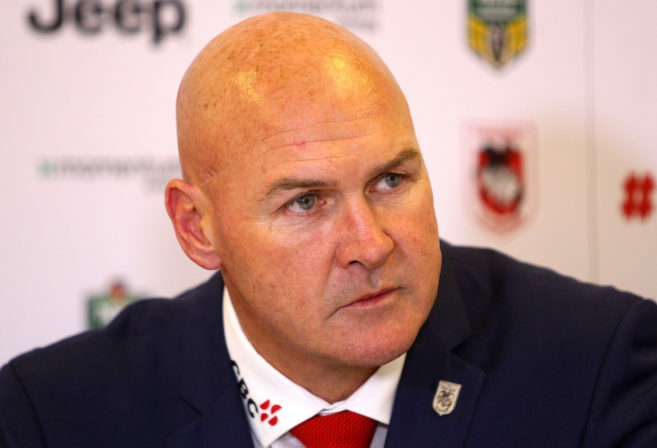 Does Paul McGregor need to go? How the heck have we ended up at a talking point like this? In the circus that is the NRL coaching merry-go-round, we have seen Anthony Griffin sacked, Cameron Ciraldo reinstated, Ivan Cleary almost poached and rumblings that Trent Barrett is done at Manly all within the space of a week. Yet, the headline which will start doing the rounds in the next few weeks if the Dragons can’t turn things around regards ‘Mary’ McGregor’s future in the ‘Gong. Now, there is nothing wrong with being fifth on the ladder. Normally, as a team who weren’t expected to make the eight this year, you’d smile, shake your head and shake the bloke’s hand with a new contract. But not this time for McGregor. The Dragons were in a similar position last year. Ripping start, then a long, slippery slide to miss the finals. Well, 2018 has put them on a path in the same trajectory, with the only saving grace being the slide starting a few weeks later. Even then, as we will discover shortly, their spot in the finals is far from a golden handshake thing right at the moment. The biggest problem at the Dragons is that, because this happened last year, there is no way in the world it should be happening again. It’s clear McGregor is a great coach at the start of the year and knows how to get the best out of his players. Conversley, what has become clear, is he doesn’t know how to manage workloads and such. Everyone looked gassed on Saturday night and like they had nothing left to give. That stems from a fast start to the season, but McGregor could have afforded to do a rolling rest for the entire squad over a three-week period after Origin and then aim to get back into it, rather than going full gas from Round 1 to the finals. It’s not possible to do that. The NRL is a long season in one of the toughest, closest competitions in the world. And McGregor clearly doesn’t get that right at the moment, which should be bringing up plenty of questions about both his short and long-term future at the Dragons. He won’t be sacked before the season is over like Anthony Griffin and in all truth will probably still be there next year, but it’s a major worry when a coach can’t put plans in place to stop deja vu. Regardless, the Dragons 2018 season appears to be on the rack. There is next to no chance they turn it around and do anything in the finals, which, from such great heights is a damn shame. And while this is going to seem incredibly Dragons focused, let’s stay with them for a moment. Could the Dragons really miss the top eight? And if not them, who could the Tigers replace? The Tigers won, the Dragons lost (as you might have already worked out through the start of this column) and all of a sudden, a team who was at the top of the table not so long ago could miss the eight. It’s not unfathomable that with three weeks to go, the four-point difference could easily be turned around. The Dragons had clocked off for the season yesterday. Their performance was one of a broken down team who had no energy or will to play left. The men from Tigerland, on the other hand, will be buoyed by the fact Ivan Cleary has committed to the club after the coaching circus and could well go undefeated to the end of the season – although there is a tough game against the Rabbitohs to come. Regardless, the Tigers play the Dragons next week. They could cut the gap on the ladder to two points with a win, and from there, anything is possible. The Dragons face the Bulldogs and Knights in the final two rounds, and with one of those a bogey club and the other Old Boys day in the Hunter, they may well get smacked around like they were by Parramatta on Saturday. The for and against difference is enormous, but the Tigers have already beaten the Bunnies once, so if they can win all three games, it may not even matter. If not the Dragons though, the Tigers could still replace the Broncos, Sharks or Warriors, although none of them look likely. For results to go that badly for those three clubs, things will really have to hit the proverbial fan. Of course, that’s if the Tigers can be good enough. They weren’t at their best on Sunday, granted, but this is a club with enough talent to shake things up. It’s embarrassing for the Red V that we are even here talking about this, but even if they do scrape into the finals, it’s going to be a with a whimper and in all probability, they are going to be thrown straight out of it in Week 1. As much as I’d like to just go on a 2000-word rant about the Dragons, there are other things to talk about. And at the top of the list is the Panthers. What a crazy, hectic, chaotic week it’s been. Anthony Griffin is gone, Cameron Ciraldo is in, Ivan Cleary won’t becoming and the future of his son Nathan in the halves is just a little bit unknown. As much as I want to talk about the coaching circus, it’s been done to death, so let’s focus on what actually happened Saturday afternoon on the Gold Coast. For a team who supposedly didn’t want to play for Griffin, nothing looked like it changed as the well-respected Ciraldo took over the helm of the battling club. They find themselves back in the top four, but it wasn’t much of their own doing, with the Titans defence falling to bits in the final five minutes, allowing Penrith to put on a couple of tries and come back from the dead for the umpteenth time this season. Simply put, the Panthers should have been up to play for their new coach. They weren’t. Come the finals, they can’t continue to try and keep doing it from behind each week. It simply won’t work like that against the best teams in the competition under the pump. If you were to stop games after an hour, the Panthers aren’t even close to the top eight. They are the best closing team in the competition, but producing three or four miracles in a row during the month of September isn’t doable. They need to start faster, be better for the 80 minutes and find a way to do it in a hurry or it could be a bitter end for Ciraldo’s side. All of a sudden, the Sharks have proven themsleves against one of the supposed three premiership hopefuls with a staggeringly good defensive effort on Sunday afternoon in the final game of the round. While the Storm were far from perfect in attack, Cronulla at one point had to defend about five consecutive sets on their line, but not once did they look like being cracked. Even under fatigue, they just didn’t give in. It was superb to see, and reminded us a little bit of 2016 where they just continually turned up, time after time, round after round. It took them to a premiership. That and their patience in attack, which seems to be slowly returning as well. One of the big problems last year for the men from the Shire was their issue with trying to score every set. They have been slowly getting off that horse and it was clear to see against the Storm. If they can keep doing that, the Sharks could be a premiership hopeful, but they need a fit Wade Graham. The veteran and former State of Origin second rower has had the season from hell in terms of injury. He has spent seemingly more time off the field than on it, but he is such a loss for the Sharks. Some of their inconsistencies have been through the injury of Graham. He brings the left side of the attack together and adds to much in defence. When he is out, the loss is felt right across the paddock and gives opposing teams a weakness to aim at. If Cronulla are to make a play for the premiership, Graham can’t afford to be watching it from the sideline. On a side note, how bloody good was the game against the Storm? Wow! What should we really make of the wobbly Warriors? I’ve been grappling with this issue for a few weeks now, trying to work out exactly what to write. It’s why they haven’t popped up a great deal in this column. I genuinely believe their spine and the talent they have across the park could be enough to guide them all the way to Homebush on the final weekend in September. 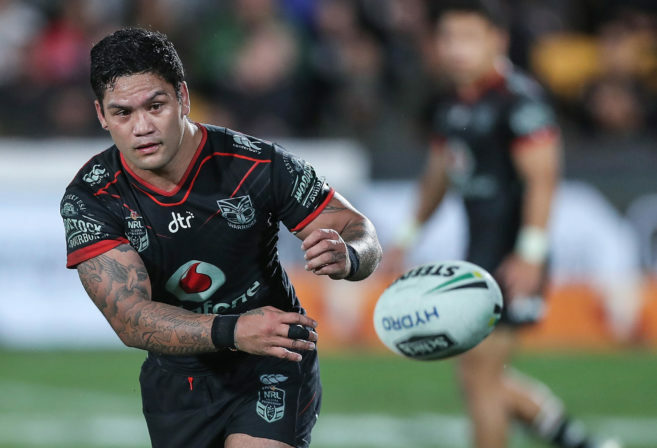 They need to learn to win consistently again – especially on the road – but with Issac Luke in the best form he has displayed for half a decade and the brilliance of Roger Tuivasa-Sheck and Shaun Johnson on the paddock, how can you write the Auckland-based team off. As the saying goes, the finals are virtually a new season. Forget about the rest, it’s time to reset the clock. The Warriors have gone from the team most likely to be knocked out to the team everyone needs to start worrying about again in the space of a few weeks. Their 20-4 win over the Knights on Friday evening was clinical, but more so, it showed their defensive grit, determination and line speed which they built a staggeringly good start to the season on. For a team everyone expected to falter completely, they have held it together just enough. Not by much, but they have, and a lot of that has still been down to their defence, which is fast-moving and compresses on ball runners with ease. The Warriors won’t be an easy team to beat when the whips are cracking during the month of September and with two straight wins under their belt not, they could very easily finish fifth or sixth, leading to a home elimination final. If that’s the case, it’ll be a case of good luck. Their opponents will need every bit of it to win across the ditch. It’s still hard to know what to make of the Warriors, but there is every chance they go on a run now to cause some serious headaches. The Rabbitohs are still premiership favourites, but did we just see a grand final preview? This may seem just a little bit on the odd side, given the Rabbitohs just lost to the Roosters. But when you lose your fullback after two minutes, lose another from the bench and don’t have Greg Inglis on the field to only go down by four points, you know you’re on a good one. More so than that though, the Bunnies shouldn’t have had much in the tank. They were right up seven days ago for their win over the Storm, so to get back up and hold the Roosters to just 18 points despite everything going against them throughout the contest was an impressive effort. While the Roosters were without Luke Keary, they should have won by a lot more. 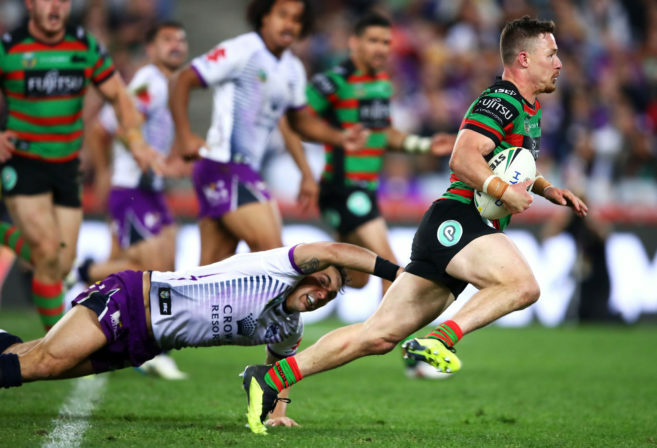 The Rabbitohs are gritty, and with the Burgess brothers and Damien Cook firing, the group working in tandem to dominate the ruck, they are an incredibly difficult team to slow down, let alone stop altogether. Credit needs to go to the Roosters though. They found a way to wi that game, and have been on a serious run ever since the beginning of Origin. When Cooper Cronk said post-match the tri-colours have found their identity, he wasn’t far away from the mark. They are starting to attack with freedom and it’s getting more and more obvious as each week goes by. James Tedesco leads the charge, but Cronk himself is starting to adapt, while their forwards have also been strong. Simply put, right at the moment, the Roosters and Rabbitohs seem to be the two most complete teams across the park. It’d be an epic to see these two sides heading to the grand final together, and at the moment, it’s certainly not beyond the realm of possibility. Where on Earth has that been all year from Parramatta and North Queensland? How frustrated would you be as a Parramatta or North Queensland fan? I mean, sure, you won, but where has it been all year? The two sides have followed similar storylines throughout the year. Before 2018 got underway, both sides were expected by a vast majority to be at the pointy end of the ladder and playing good footy at the business end of the season. While the latter might be starting to come true as the bottom sides pick up some wins to try and avoid the dreaded wooden spoon, they are certainly not at the pointy end of the ladder. It’s been a true season from hell for the Cowboys. The grand finalists of 2017 were welcoming back Matt Scott and Johnathan Thurston, but simply haven’t clicked. Lachlan Coote is out of form, Michael Morgan is injured and the once stunning form of Jake Granville nowhere to be seen. 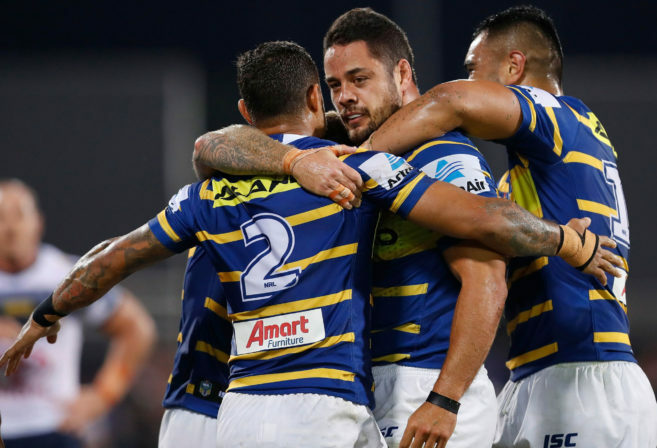 The only issue Parramatta seemed to have before the season started was a lack of go forward in the eight and ten jumpers. Instead, they have had a lack of go-forward everywhere, no care factor in their defence and very little creativity from the halves. Whichever way you spin it, they haven’t been good in 2018. The sides will face off in Round 24 and pending other results, both for them and the Bulldogs, it could well be the game to decide the spoon. When you see how they both played on the weekend though, with the Eels scoring 40 and the Cowboys 34, it must hurt in a big way. Last week, I as good as wrote the Broncos’ chances of winning the premiership off, so a title like this should really come as no surprise to anyone. They were actually better against the Cowboys though. While they did go down and there were some – let’s say interesting – refereeing decisions in the process, a trip to Townsville is never an easy job for the Broncos. No matter the ladder position, the Queensland derby between the two rivalries always seems to go up a gear and with a total of 64 points scored on Thursday night, the latest edition didn’t disappoint. So while Broncos fans shouldn’t neccesarily be overly concerned with a loss to the Cowboys, they should be very concerned with some of what they have dished up at times this year. The inconsistency from Wayne Bennett’s side is mind-boggling. In fact, I had tipped the Broncos coming into the game simply because they lost to the Bulldogs the week prior. Anyway, the last two losses mean the club have now let in 70 points in the last two outings, which is not good news for a team whose defence has been up and down, but shown more good than bad for most of the year. While their attack has been the main concern, it’s becoming clear when Brisbane turn it on, they have more than enough weapons on the back of a rolling forward pack to put the points. What isn’t clear is how they stem the bleeding in the finals on their own line. While they shouldn’t miss the finals – it’s hard to see them losing five straight on the run to the finals for the Tigers to overtake them – they don’t even want to enter having lost four of five. It’s very much pressure on for Brisbane with key names like Andrew McCullough, Anthony Milford and Darius Boyd needing to fire in a hurry. Roarers, what did you make of Round 22? Drop a comment below and let us know.